This topic contains 277 replies, has 24 voices, and was last updated by Darkest Star Games 2 weeks, 5 days ago. After having a guest yesterday we both came to the conclusion, especially in light of the number of house rules made, that maybe I need some slightly meatier fantasy rules. Last night I failed to sleep as I was mulling ideas over in my head. My rough thoughts thus far are to have three stats. But the naming has stymied me. There is a physical prowess stat (brawn, matter? ), a mental stat (brain, mind?) and a life force stat, which as it goes I have a name I am happy with, Vitality. What names can you think of that could be the brain and brawn stat? This topic was modified 1 year, 2 months ago by Angel Barracks. which as it goes I have a name I am happy with, Vitality. Does the physical stat cover Strength, Dexterity and Agility? If so I don’t think Brawn really works as it only suggests strength. How about Body, Mind and Spirit for your three categories? Body and Mind make perfect sense and should provide no ambiguity. But… they feel wrong somehow. I think I kind of want older feeling words. Wits I may use for the brain / mind stat. Vigour or Vitality for the life force type stat. I suspect the names will be changing all the time until it is published! I really like General Slade’s names. It is going to be pretty hard to find any English words older than “body”, “mind”, and “soul”, as they all come to us from Old English. “Prowess” is a borrowing from the French that didn’t come in until Middle English, and while “vitality” has older origins, we didn’t nick it for English until the 16th cetury, which makes it a teenager compared to the others. Obviously the best names are going to depend a lot on what the stats do in the game, which we don’t know yet. but I rather like the idea of having a scheme that acknowledges this trinitarian division of the elements of a person, which seems to be quite a traditional one. 1. The Full Englisc. This might give “craeft” (strength), “witt” (wit, intelligence, cunning), and “gāst” (soul, spirit). 2. Greekish. To sound Greeky, we can have “soma” (body), “noös” (mind, understanding), and “psyche” (spirit, soul). Probably it wouldn’t be hard to come up with similar terms based on Arabic, Persian, any of the Chineses, Amharic, whatever you like, I shouldn’t be surprised if you couldn’t make a stab at Proto-Indo-European. I know nothing of the setting of “The chronicles of Simurgh”, but it sounds to me as if the “full Englisc” suggestion would fit better than the Greek, even though “chronicles” is a distinctly Greek-tasting word. Having found an on-line PIE translator, It seems that “body”, “mind” and “soul” would be “kṛpos”, “mṇtis”, and “etmṇ”. The first two are very obviously related to the Latin “corpus” and “mens”. I am trying to avoid spirit and soul as they have religious connotations. For now I have gone with Prowess, Wits and Vitality for the drafting. But keep the suggestions coming. Body and Mind make perfect sense and should provide no ambiguity. But… they feel wrong somehow. I know what you mean, Mike. When you put the three together Body, Mind and Spirit does sound a bit ‘New Age’. You don’t want your rules to sound like a self-help book. Is this ruleset to be themed around musclebound swords-and-sorcery, or more generic? In the former case, the language of “Howardese” seems a good ideal. This is the language in which daggers can be dripping “redly” with blood. I think that in passages relating to physical prowess, REH was rather enamoured with words like “thews” and “sinew”. Going beyond language alone, situations relating to keenness of mind were generally to do with shrewdness, cunning and craft as opposed to things like sagacity, knowledge or enlightenment. But again, this is all assuming it’s not to be a generic or wide-scope fantasy ruleset. Mighty heroes are of course better fighters than normal thugs. But what really sets them apart is their unrelenting nature, they will not stop when exhausted, they will not flee when wounded, their minds will not buckle in fear. They are made of sterner stuff and can push past the barriers that normal people fall at. It is this extra vitality that makes them who they are and as such that is the key focus on these rules. Prowess – the physical side of the character, swimming, running, brawling, fighting, archery etc. Wits – the mental side of the character, perception, skills and knowledge, mental resilience, charm etc. Vitality – the life force of the character, stamina, endurance etc. During the game the characters will be performing tasks. That’s a very good question – are we looking at a new ‘Conan’ game, CROM 2.0 or something else? But as it comes it falls a bit short for what I need. I have already changed the magic system, altered how minions lose dice when hit and created a few skills and basic experience system for my games. I figured rather than make it fit the hole it was not designed to fit, I will make a new set. One of the things that makes me a bit sad about Crom is that a Bad Guy Wizard with 10 dice could use those 10 dice in combat and be an equal in a sword fight to Red Sonja. Plus if you wanted to just live when in a sticky situation, then put all 12 dice into movement and run off the board in the first turn and yay, you did not die. Clearly that would be playing the rules and not playing the story but I guess the little things add up after a while. So these will be new rules that will address all my own needs. Will they work for other people, for some yes, for others not. Anyway, I must away and test the combat system some more, it is proving to be a bit bloodier than CROM! in that you seem less invincible. So to test the combat and compare to CROM! I set the hero up against 3 typical bandits. 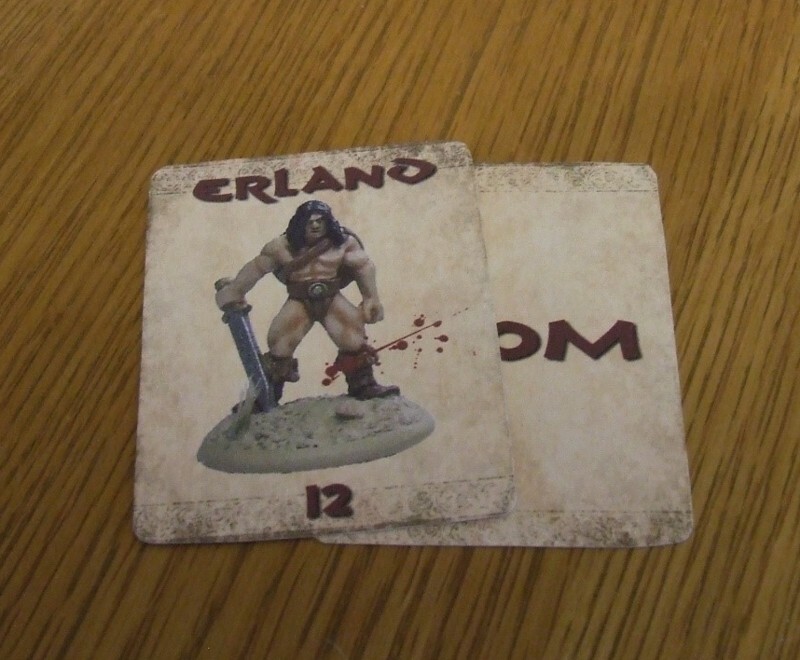 I fought the set up 40 times using my rules and 40 times using CROM! But instantly we can see that Chronicles are a lot less certain in their outcome. I think this is preferable for me as CROM! was almost a foregone conclusion when I played and from the small test run above the results seem to back this up. So, so far, the combat system seems to work, is a bit more brutal and in mechanics terms a lot more complicated, but in the grand scheme of things not that complicated at all, it is just that CROM! is mega simple/quick. I would like to take this opportunity to point out is not a version of CROM! CROM! has free allocation of stats, mine does not. CROM! 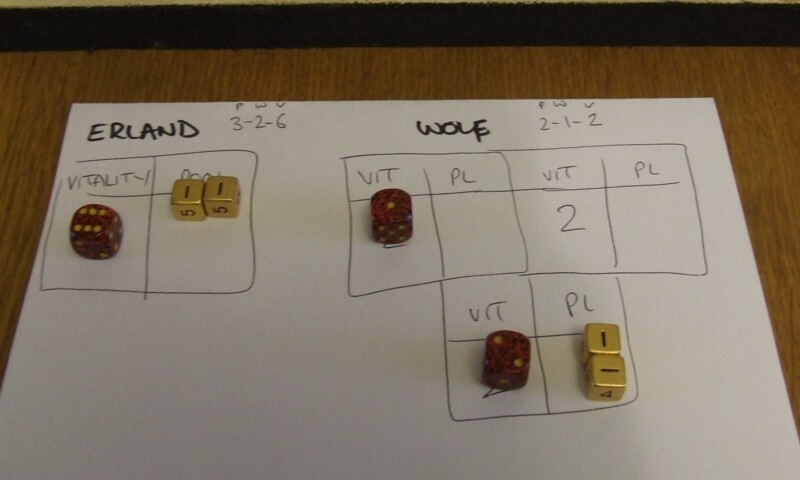 has a dice pool which allows you to determine how powerful attacks are. 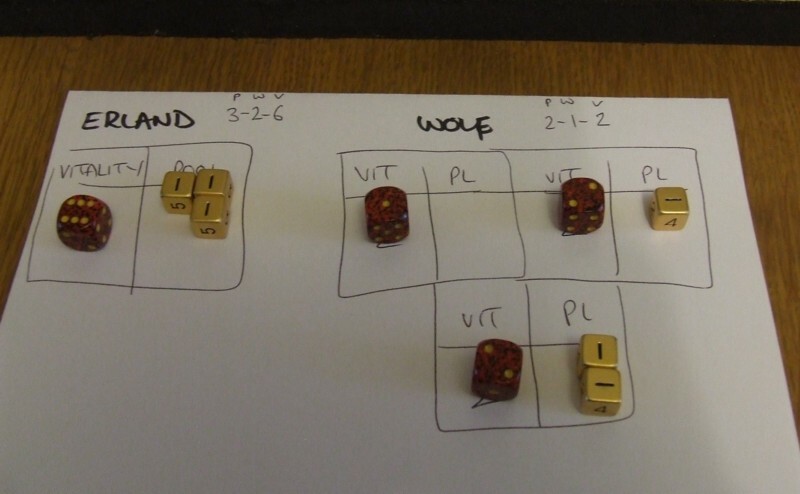 My pool is not a dice pool, it is an Vitality point pool which determines how many actions you can make, each attack from a hero is always the same number of dice, based on their fixed stats. Mine has a task based system and Vitality determines how many tasks you can attempt. It has open, closed and opposed tasks. So to clarify… it is a new game! Cool. I wasn’t criticising, just wanted to clarify. From what you’ve said above, it sounds ‘better’ so far than CROM. Very interested to learn more and would like to help in any way I can. 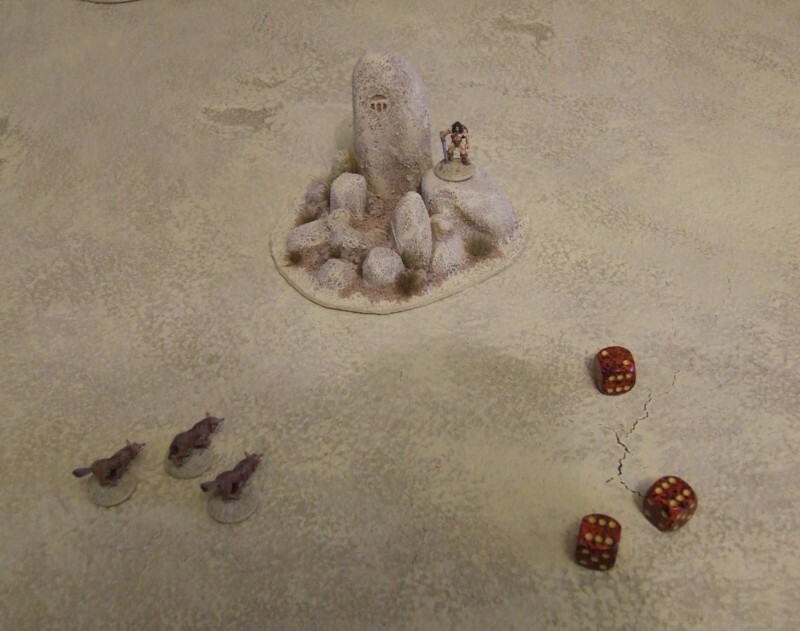 Are you designing it as a solo game from the ground up? Cool, not suggesting anyone was but I think it important to say early on that they are a standalone set of rules of a ‘new’ design. Not really solo no, but as the activation is random then that should add enough uncertainty to allow solo play. There are no AI mechanics and I suspect the game would work best maybe as one player is the bad guys and the heroes are played by a player each. Maybe 3 players, 1 as the baddies and each remaining player having a hero each. So we have Erland vs a group of 3 wolves. Erland is Prowess 3, Wits 2 and Vitality 6. The wolves are Prowess 2, Wits 1 and Vitality 2. Vitality is your stamina and life force, the game is played by performing tasks and your vitality determines how many tasks you can take in a turn. There are plenty of ways of doing it, you could use beads, coins, I use dice simply as I have them to hand. If using dice you could, rather than having 6 dice for Erland, just use a single d6 and reduce the number as he uses up his vitality pool. 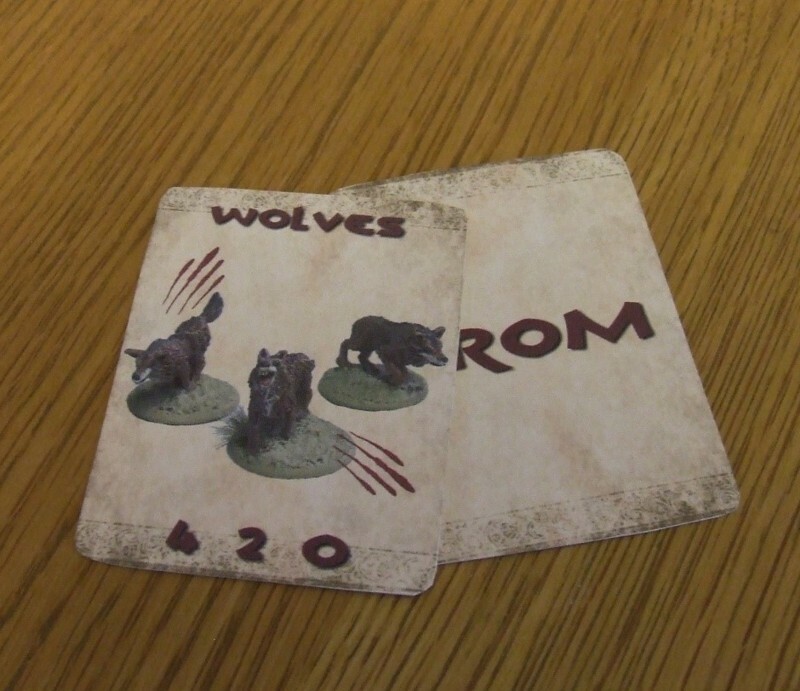 We place a card for Erland into the deck and a card for the wolf group into the deck and draw to see who comes out first. It is Erland’s card which comes out first, so he can choose to go first, we decide to use 1 vitality point from the pool to perform a task, moving in this case. Moving is a prowess task so we roll our prowess stat which is 3. 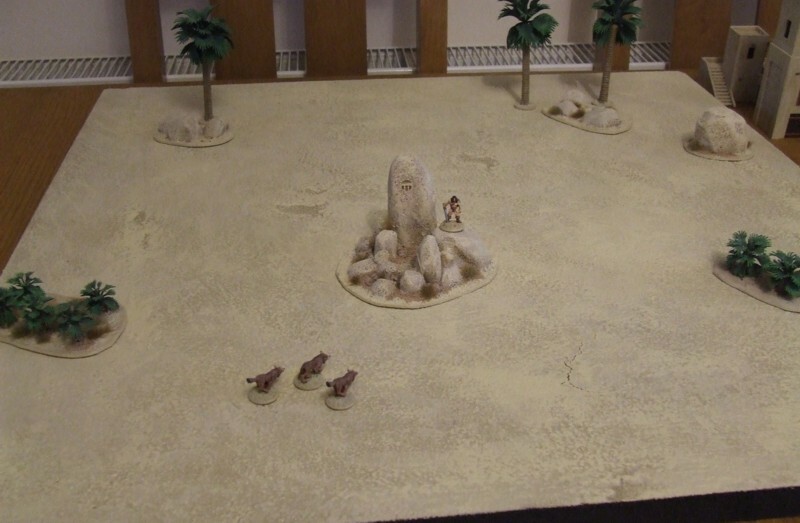 3d6 turned up 14 so we move 14cm, which just about gets Erland into base to base contact with the group. So Erland is in hand to hand and has 5 vitality left in his pool. We perform an attack which is a task so we remove 1 vitality from the pool. The wolf, who is the target of the attack uses one of it’s vitality from it’s pool to defend. This reduces Erland to a pool of 4 and the first wolf to a pool of 1. 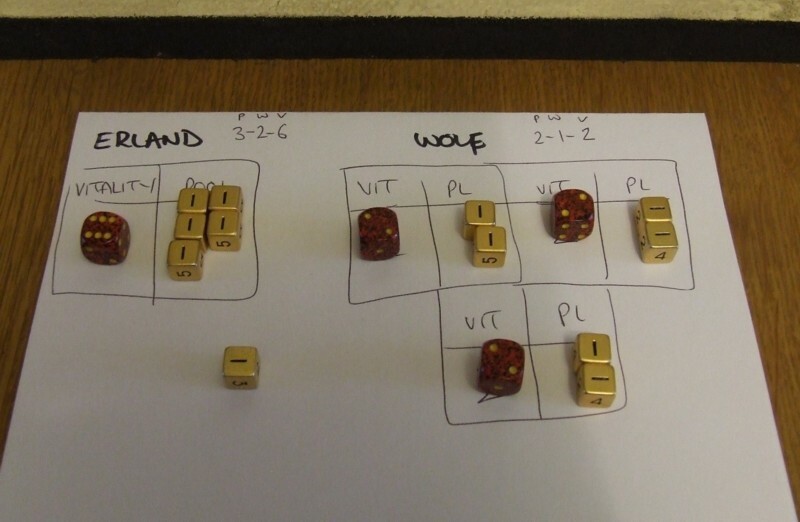 Erland has a prowess of 3 so rolls 3d6, the wolf has a prowess of 2 so rolls 2d6. When you win an attack the loser must remove 1 from the vitality stat (the permanent stat) and also 1 from the pool. The loser has taken a wound. We can see the wolf is not dead, as it still has 1 left in its permanent vitality, however it’s pool is empty so it can not carry out any tasks for the rest of the turn. Erland has a choice to make, does he attack the wolf by performing a task and spending a vitality and kill the wolf outright (it has no pool to defend with) or does he ignore it as with no pool, it is not an immediate threat. We opt to ignore it and instead spend a vitality from the pool to attack the next wolf. We remove a vitality from the pool to attack and the wolf removes one to defend. 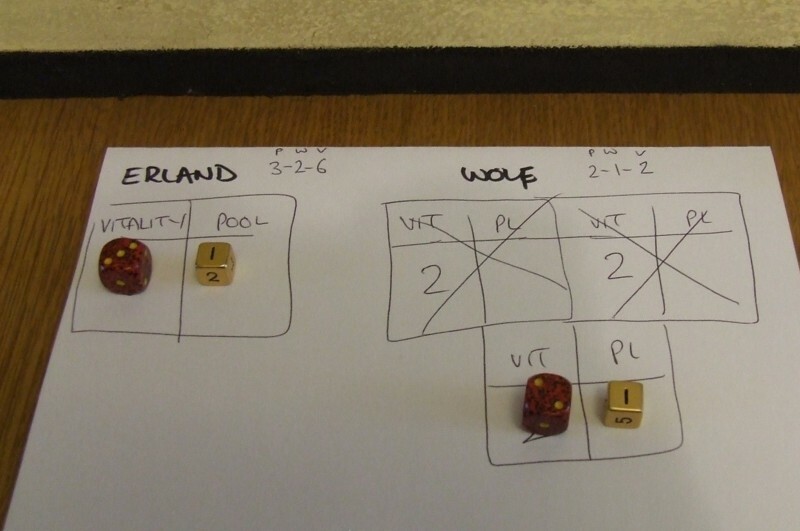 We can see Erland is now down to 3 vitality in the pool and the wolf to 1. Again it is an opposed prowess roll. 3d6 vs 2d6. Erland wins so we remove 1 vitality from both the permanent and the pool. This also takes this wolf out of action for the rest of the turn. However this time we elect not to ignore it, but rather we spend a vitality to attack the same wolf. It has no dice in it’s pool so can not defend, which means we win and again reduce both the permanent vitality and the pool by 1. This reduces the wolfs permanent vitality to 0 and it is slain! So we have Erland with 2 pool left, a wounded wolf and another wolf at full vitality. We use a Vitality to attack the wolf, who uses 1 to defend. 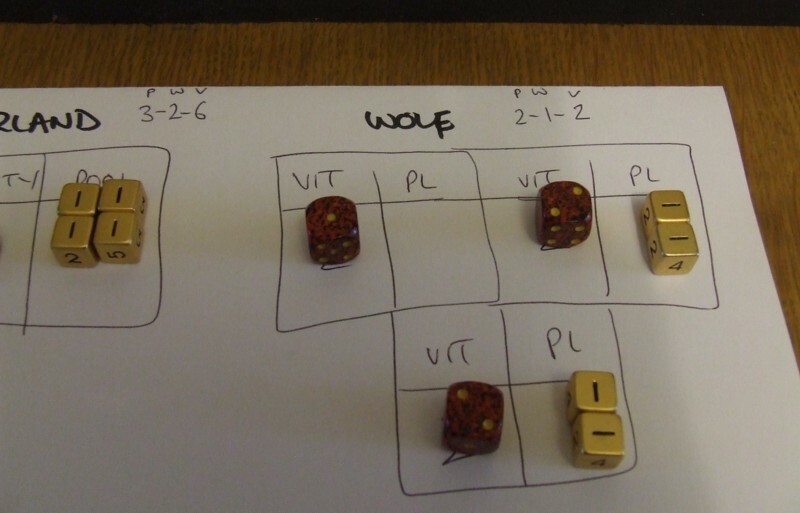 The wolf wins, but not only did the wolf win it had a 6 in its total! So we remove 2 from Erlands pool (making it 0) and from his permanent vitality which now becomes 4! The wolf however has a point of vitality in its pool so sensing Erland weakening it attacks again and as Erland has no pool to defend with, he loses 1 from his pool and his permanent vitality taing that down to 3??!! However, no one has any vitality in their pool so the turn ends. The next turn begins and we top up the pools based on the vitality stat. We shuffle the cards and draw the top one, the wolves come up first. 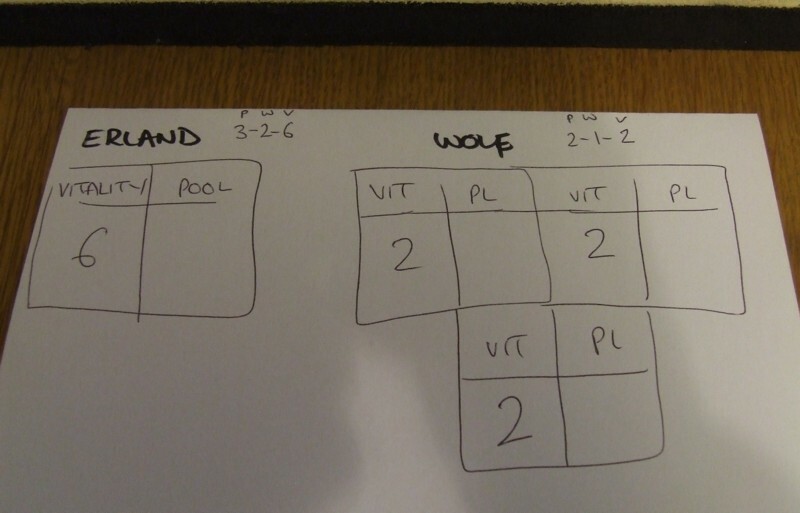 We have one wolf with 1 vitality and 1 in the pool. We have a final wolf at full strength with 2 and 2. Erland is 3 for 3. The first wolf attacks and uses its sole vitality pool point. Erland uses 1 to defend. The wolf rolls a 10 but Erland rolls 13. 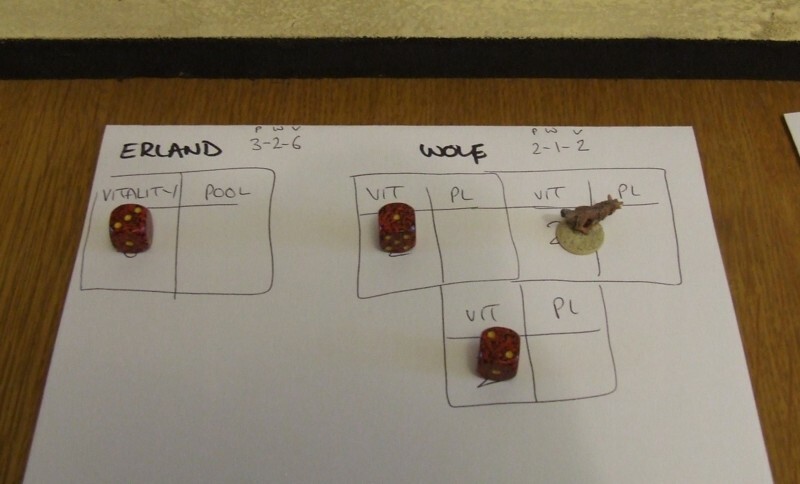 Erland wins and that wolf is slain as we remove 1 vitality from each and this takes its permanent vitality down to 0. 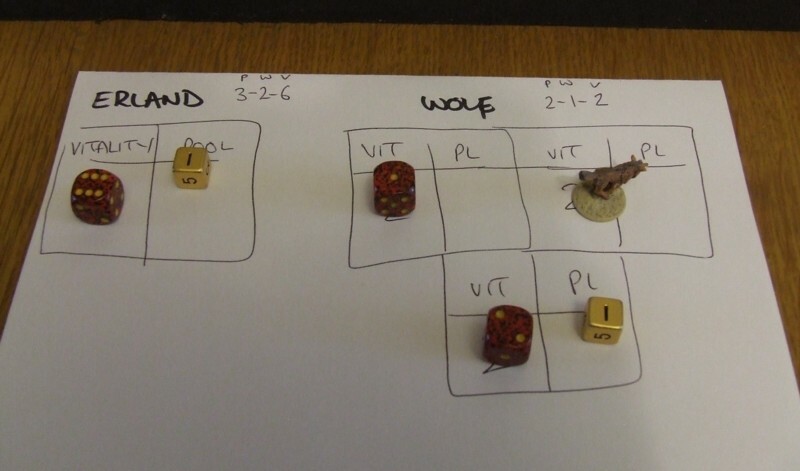 The last wolf uses 1 from its pool to attack and Erland uses 1 to defend. Erland wins and we remove 1 from both the wolfs pool and permanent stat. This leaves Erland with 1 in the pool and the wolf with 0 in the pool. Erland uses his last vitality point to attack the wolf and finish it off. Bloody and wounded, Erland managed to see off three savage wolves. Vitality points are used to fill up the vitality pool. Points from the pool are used to perform tasks, in the case of the above, movement and fighting. I like it. If you want to have more heroic action though, I think you should increase the hero’s vitality? That is an option, this will give you more vitality pool for tasks and also allow you to take more wounds. Another option is to increase prowess from 3 to 4. This won’t grant any more tasks, but in the case of prowess based tasks such as fighting you are not only more likely to beat a prowess 2 bad guy, that extra d6 will increase the likelihood of the attack being a critical. So by increasing prowess you are more likely to despatch baddies with a single attack. Swings and roundabouts as to which feels best. It is all sorted now, thanks though. What other non combat tasks would you envision undertaking? Like, though you could find your hero dead frighteningly easily! I would also put forwards that maybe if you roll more than double of your opposition it should perhaps be a critical. You could then in theory score a double crit with that and 6’s. That would hurt! I would also put forwards that maybe if you roll more than double of your opposition it should perhaps be a critical. You could then in theory score a double crit with that and 6’s. That would hurt! I did debate this, but wanting to keep it quick I decided to pick either 6’s or double the score for a critical. 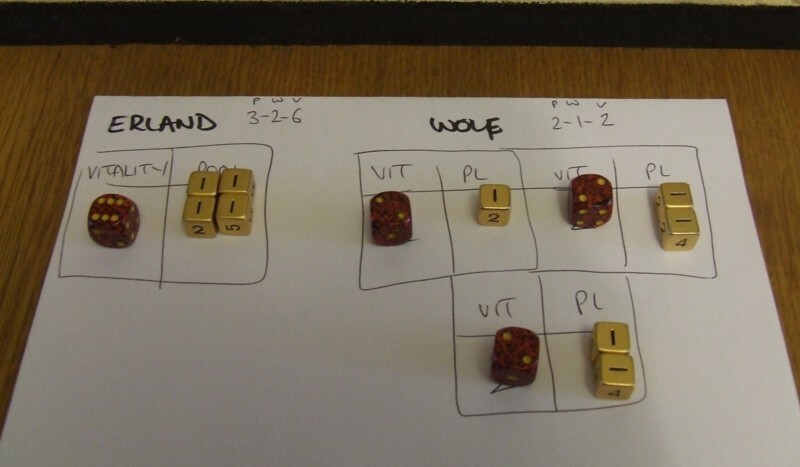 The maths did not show much of a difference in which is more likely to give the critical result, so I opted for the 6’s as that is much easier to identify quickly on the tabletop. As for skills, they are a bit too roleplay for my needs. These will be a combat game so things like making a house and taming an animal are not really what I am after, thanks though. Pushing and pulling things though needs to be added. A good barbarian can always push a tree/pillar/statue onto an enemy! Stealth and detection actions, such as moving in a stealthy manner and attempting to detect someone who does so? Of course that depends greatly on whether you want to include stealth elements in the game or deliberately exclude them as something that falls outside the style of fantasy fiction being represented. Your prowess stat doesn’t really seem to differentiate a sneaky assassin or thief from a meat tank, so I have the impression you’re meaning to theme the game more around brawny warriors fighting evil sorcerors. Stealth and detection actions, such as moving in a stealthy manner and attempting to detect someone who does so? Of course that depends greatly on whether you want to include stealth elements in the game or deliberately exclude them as something that falls outside the style of fantasy fiction being represented. Your prowess stat doesn’t really seem to differentiate a sneaky assassin or thief from a meat tank, so I have the impression you’re meaning to theme the game more around brawny warriors fighting evil sorcerors. I am such a dunce, I have already done stealth rules, I forgot to list them here! An assassin could, and I would argue should, have a higher prowess, so would be something like 4-3-3. So they are much more skilled but have a much lower vitality. If they don’t get a few killer blows in early on, then the barbarians greater vitality will see them through as they can take more punishment. Did you ever see the oooold THW game Legends Of Araby? To answer your question directly, how about might, wit and vitality? If you wanted a more casual naming scheme, keep brawn and brain and change vitality to grit. How about BAM, PING, THUMP? I like the new action system. Angel Barracks, will you be posting these rules somewhere for us to try out? Yes and also no. I made the mistake of not charging for my sci-fi rules and thousands of free downloads later I am thinking I need not be wearing clothes with holes. So when shiny and done these will go on sale. Clearly I don’t expect to sell thousands, or even hundreds for that matter. But a few dozen at £5.00 is better than 2000 at £0.00. 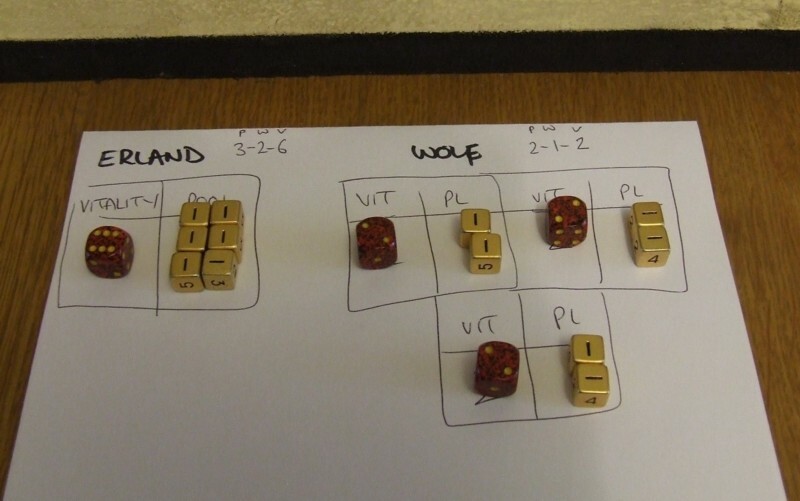 Currently I’m running 10mm coppelstone heroquest but I’m looking for something new. Keep me in mind! do you think a nine year old could handle your new rules? Well that depends on the child. I certainly think most should be able to grasp the mechanics, my daughter certainly could, not sure she cares much for the subject matter though! Drop me an e-mail and I will e-mail the draft so far.